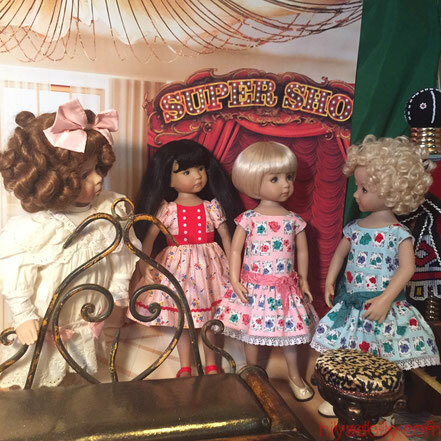 Tomi Jane, doll dressmaker and designer extraordinaire! I am an unabashed fan of Tomi's. And she has kindly allowed me to fawn over her work for ages. 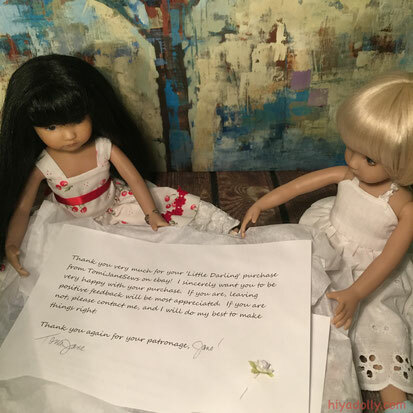 Because kindness is Tomi's second talent, right behind creating the prettiest, perfect dresses for my favorite dolls, the Little Darlings. I am going to gather here all my blog posts and all my photos of our Tomi Jane dresses. Because we have five. Yes, five Tomi Jane dresses. The photos will be of my Little Darlings at their best. Best behaved, best tea party, best spring party...because that's when we get out our Tomi Janes. While I gather, feel free to jump over to Tomi Jane's beautiful Flickr pages. 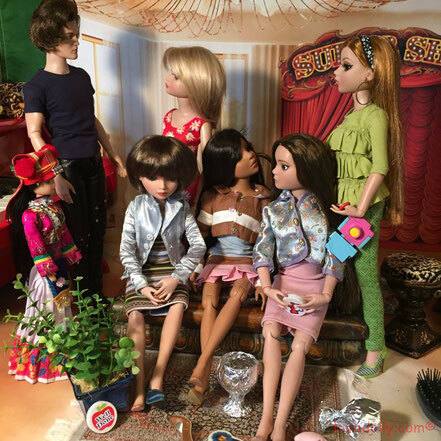 And while away an afternoon, sipping tea and imagining what Tomi's pretty dolls would be up to in their pretty dresses. I have spent many a Saturday afternoon myself, looking, when I should have been polishing my silver. 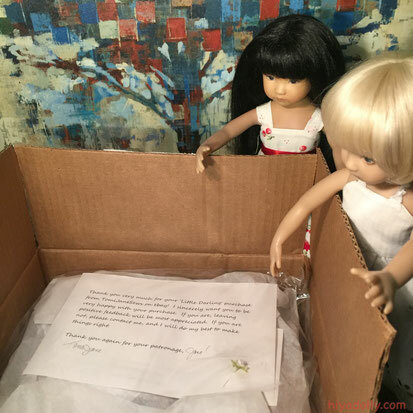 After months of abstinence, I followed a link to eBay, from a Facebook doll group. There I discovered an unusual occurrence...Tomi Jane dresses. Several of them were posted for bids. I 'watched" several, left, pondered, returned. And ordered two favorites that I had seen often, when I would peruse Tomi's Flickr pages. scrolling through her years of impeccable sewing accomplishments. Beauty! 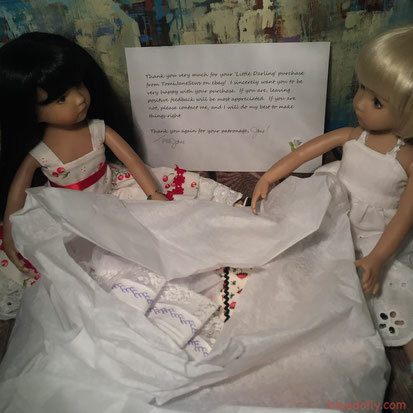 And we are thankful to gather two more Tomi Jane beauties to our dolly closets. The Tomi Jane package arrived when the girls were at the Ocean Beach. 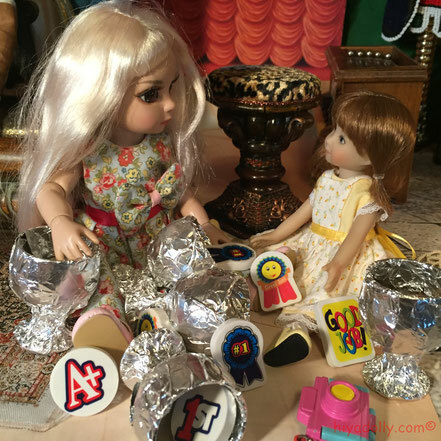 We gave a heads up to Pearl and Anna Zoey, as their photo shoot here was done first. We brought them to the Dolltown Tree to open the package. Tomi Jane always includes a lovely note. The girls are good readers and there isn't a word they don't know! Choices! A pretty tea dress full of patterns. And a simple white sundress with periwinkle accents. 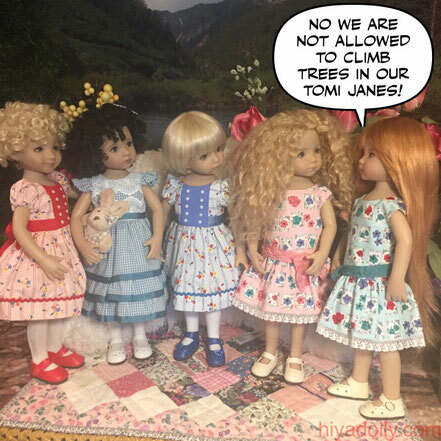 Tomi Jane says she is done with Little Darling doll dressmaking. 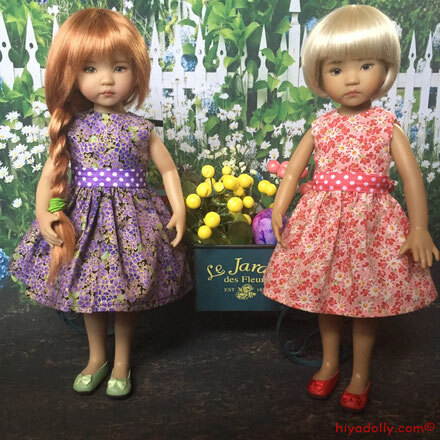 So these outfits are happily added to our select Dolltown Tomi Jane dresses. Sadly, too. As a Little Darling era of new Tom Jane collections to look forward to, has ended. But let's not stay sad! The girls are at the river in their pretty Tomi Janes. I wonder what Tomi would think if she heard them? We do our best to be good. As good as the dresses are! Lula, it's "Where are the eggs, please? Who suggested climbing trees anyway? This is a dress up event! 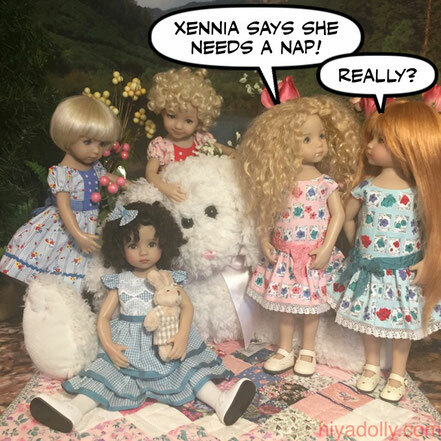 And Xennia, I don't think one is allowed to nap in a Tomi Jane.... Xennia? I do think the girls would do their best if invited for tea to Tomi's, with her excellent girls. I would teach my girls how to hold a tea cup, and how to nibble on their little sandwiches. And tell them not to put the pretty cakes in their pockets to bring home, if there are any left. Just give me a couple of months to pass on to my girls good Tea Time Tips! 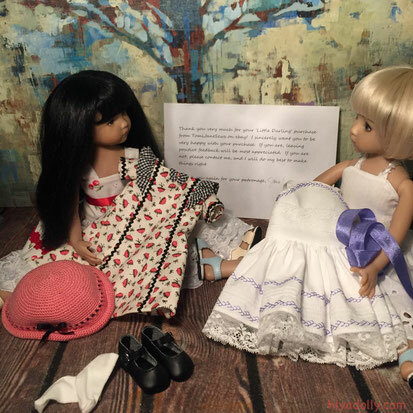 A story of a new dress from Tomi Jane, a favorite dressmaker in Dolltown... It has been tucked away in tissue for months! 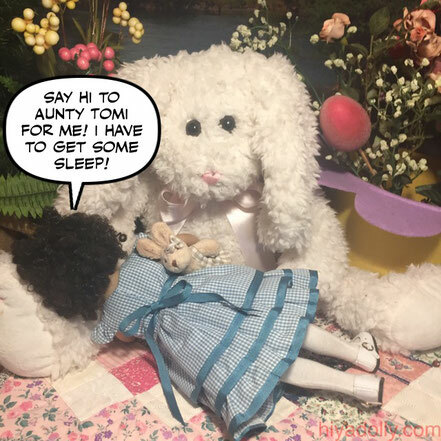 It's Easter week! But the Little Darlings are still at the river and aren't ready to fancy up. They have a very special picnic to enjoy yet! But I have their dresses laid out for them for when they return from their river outing. 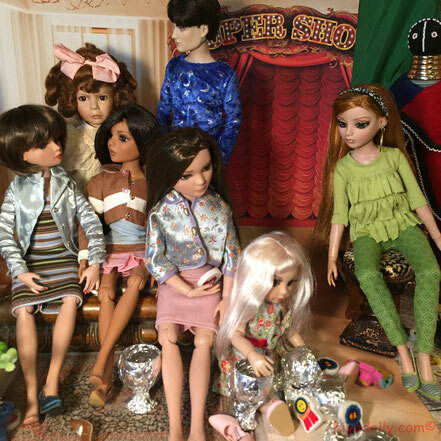 And we are going to have fun because over the year, when I cash in my sparkly water cans, I hunt for basic separates for our active Dolltown lives...or I spring for a special dress. Last fall while window shopping on eBay, I found this special dress. It is a Tomi Jane Tea Dress. And I am such a Tomi Jane fan! So I spent all my soda can money on this one dress. And that's why my girls had to wear sock dresses for Valentine's! Chantal got to try this pretty aqua dress when it arrived, and we sent her photo to Tomi with a thank you. Then we put it away until spring. And it's spring! Now, who will get to wear it when the girls get all fancied up in our prettiest dresses? And over the months we have gathered other lovely dresses, from wonderful dressmakers! We are looking forward to tea time and egg hunts in the garden, all dressed up. If only it would warm up a little! We are so over sweaters. It has been a loooong winter! 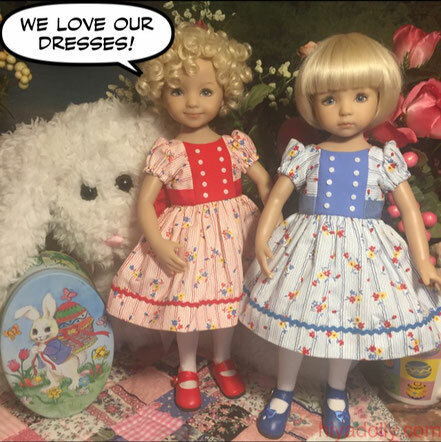 Little Darling Twinzy Spring Dresses! Success! 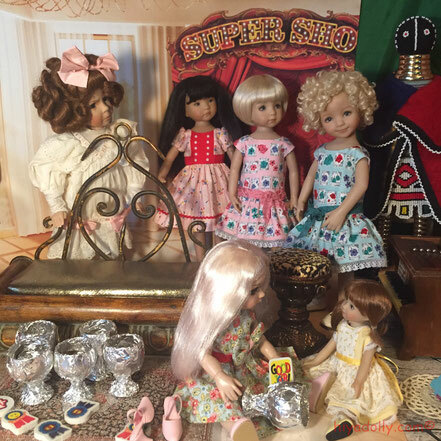 Doll dressmaker extraordinaire, Tomi Jane, had several dresses in her eBay shop, tomijanesews, for a short time. 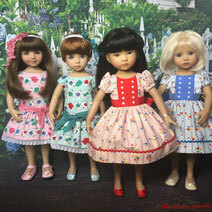 I JUMPED at the chance to acquire two matching sets for our Little Darlings here in Dolltown... Yay! We decided to match up dresses using 2 more designs. This classic style is my very favorite for its versatility. Our Little Darlings have several to choose from! 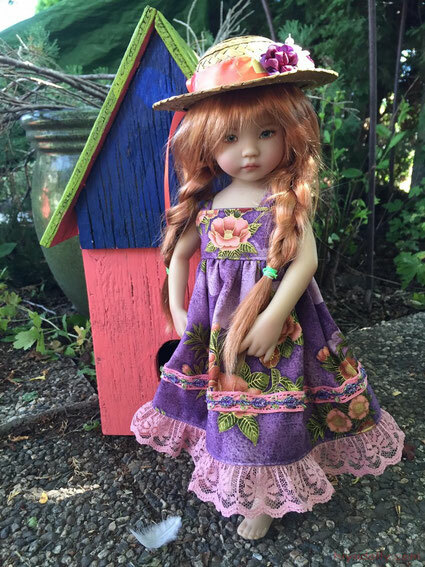 The pretty purple flowered dress was from Kathy at tkctcrafts. And Pachom Suesuwan's pink flowered dress, minus its cute white shrug. was also from eBay, at pachom10. Even her doll dressing and photography are spectacular. 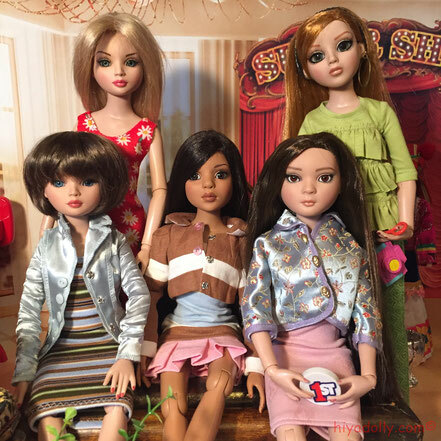 She has been featured here on Hiya Dolly more than once...even before we had her dresses here in Dolltown! Check out her work on Flickr. 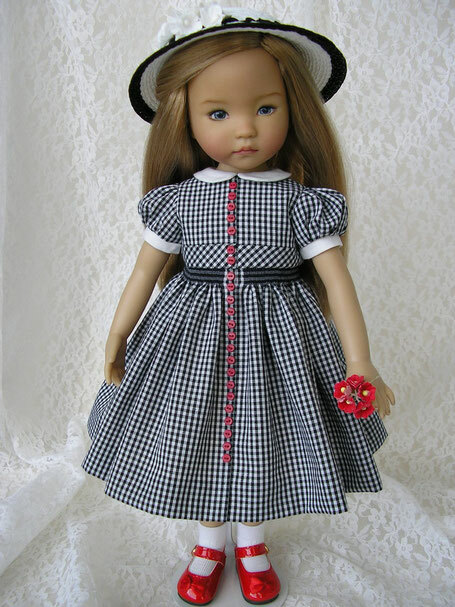 Lots of Helen Kish and American Girl photos too! More of our own photos of these lovely dresses! Colorways! Tomi Jane called this pretty series Colorways, a term used by dressmakers to describe a fabric available in a variety of colors. 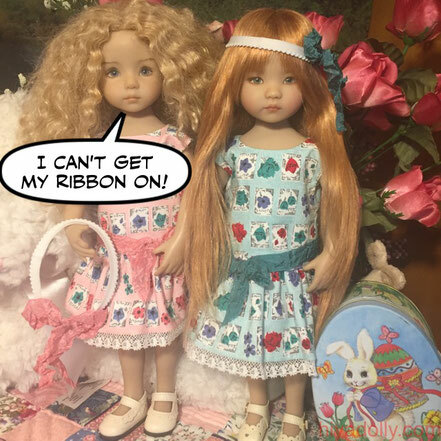 Here Tomi has added matching hair circlets in that cute crinkle ribbon. So cute! This is a new design for me, from Joyce at prairiemoondesigns, This style has a lot of skirt, little cap sleeves, and opens at the back for ease of dressing. Tempting! Especially at those prices! 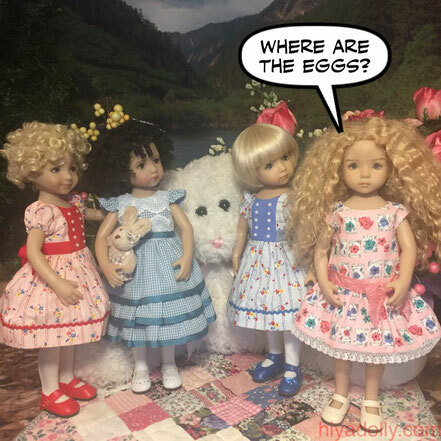 This is a doll background, with a white picket fence. 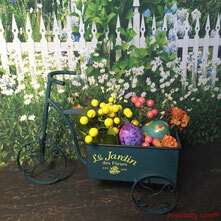 And this adorable flower wagon just arrived in Dolltown, a gift from a friend and Dolltown supporter, Mischelle. More photos from the photo shoot...we took lots of cute photos of our Little Darlings! 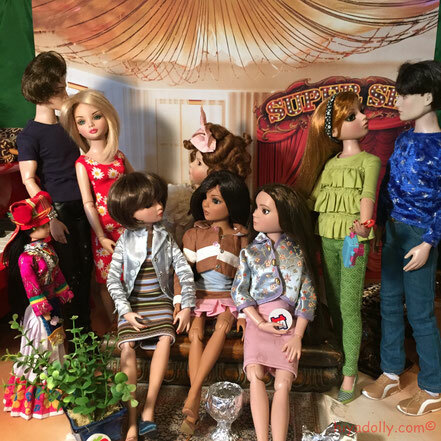 Just a few months after I decided I could live in a caftan and a shawl for the rest of my life, after a lifetime of fascination with clothes, shoes, and fashion generally, I dropped into the world of doll fashions. 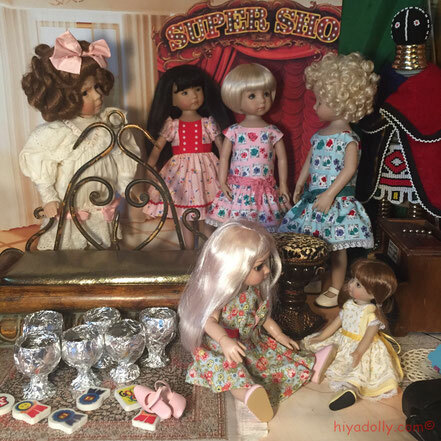 Opening my childhood trunk of Barbie and other doll clothes reignited the admiration I have for the dressmakers to the dolls. My mom herself knitted and sewed very cute Barbie clothes. This is not an easy task! And it is a joyful task that many skilled artisans engage in, as a hobby and as a living. 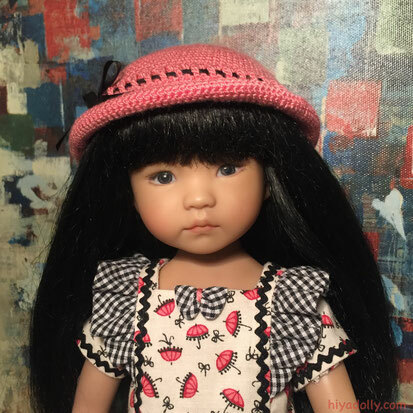 Sewers, smockers, knitters, cross-stitch experts, hat and shoemakers bring their talents to the creation of tiny fashions, to the delight and gratitude of doll collectors-who-don't-sew, or don't want to-like me. Erin Green made this lovely sundress and matching hat, and provides shoes to match... And she has a wonderful selection to choose from at her eBay and Etsy shops. 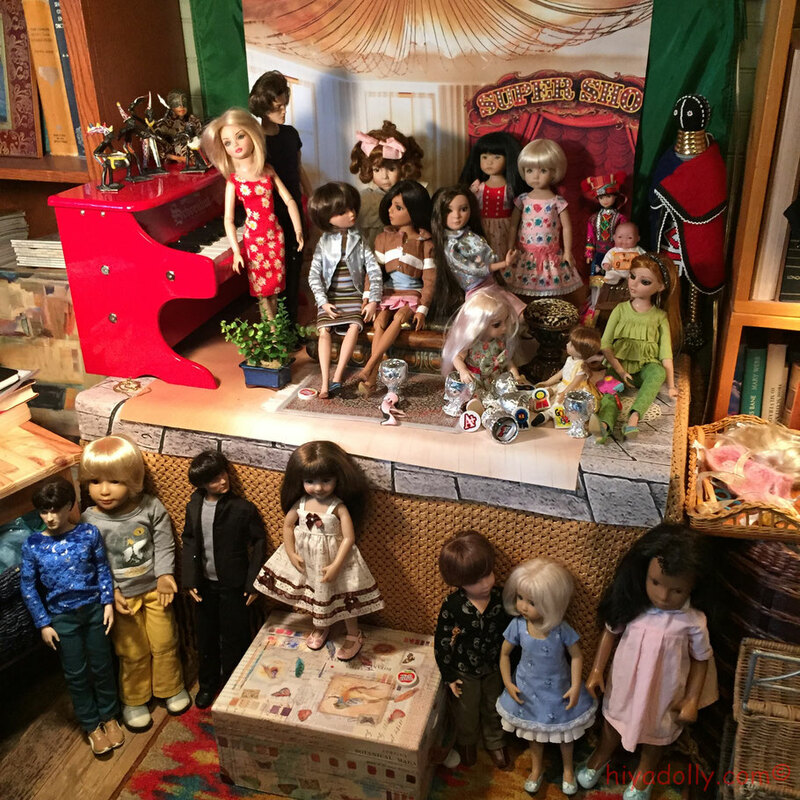 Keep an eye out here for more photos and write ups of some of my favorite doll dressmakers! 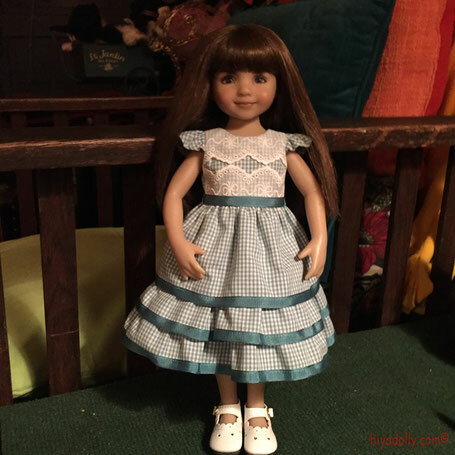 Most sell their doll clothes, like Erin's here, and Janice Mundy at Sew Sweet Designs for Dolls, and mrsbobbinsews on eBay. and Kathy Groulx on Etsy. 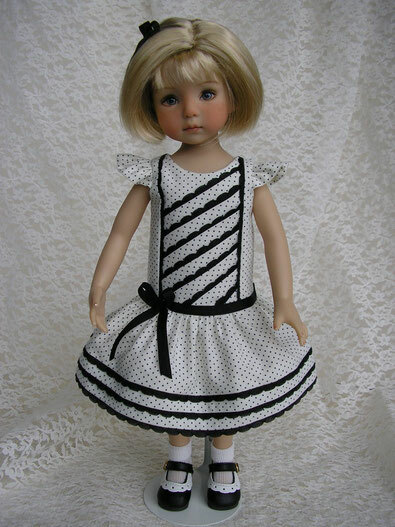 And doll dressmaker Tomi Jane's exquisite work is worth a look (on Flickr) for doll fashion lovers like myself! 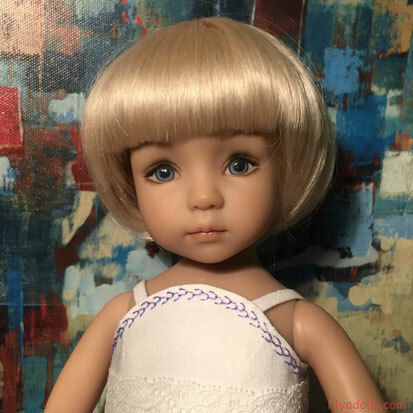 (especially for 13" dolls like Little Darlings, my focus at the moment) Stay Tuned! For now, let's go window shopping at Darling Lil' Bee! So fun!